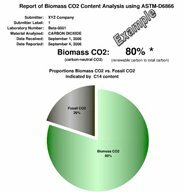 The application of ASTM D6866 to derive a “biomass CO2 content” for carbon dioxide effluents is built upon the same concepts as those used by the US Department of Agriculture to measure the biobased carbon content of manufactured products containing biomass carbon. It is done by comparing a relative amount of radiocarbon (C14) in an unknown sample to that of a modern reference standard. The ratio in contemporary biomass will be 100% while the ratio in fossil materials will be zero.1 Carbon dioxide derived from combustion of a mixture of present-day biomass and fossil carbon will yield an ASTM D6866 result that directly correlates to the amount of biomass carbon combusted and carbon-neutral CO2 generated. Carbon dioxide effluent derived from combustion of 100% present-day biomass will yield results of 100% biogenic carbon content. Carbon dioxide effluent derived from the combustion of 100% fossil fuel will yield results of 0% biogenic carbon content. Carbon dioxide produced from mixed fuels (biomass plus fossil fuel) will yield a percentage result in direct proportion to the biomass carbon consumed vs. fossil carbon consumed in the combustion. 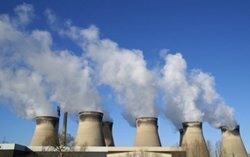 The final result is referred to as the MEAN BIOMASS CO2 CONTENT and assumes all the carbon in the carbon dioxide was derived from either present-day living or fossil sources. a conservative approximation). It is presumed that all materials are present-day or fossil in origin and that the desired result is the amount of biomass component “present” in the material and not the amount of biomass material “used” in the manufacturing process. Interpret reported percentages as maximum values (most conservative interpretation). ASTM D6866 results relate directly to the percentage of carbon-neutral CO2 in an incineration effluent. A value of 71% renewable content measured on CO2 effluent would indicate that 71% of the exhausted CO2 was from biomass (29% from fossil fuel). It does not represent the weight of biomass combusted or the weight of fossil fuel combusted. This is advantageous since the weight of the fuels only indirectly relate to the uptake of carbon dioxide from the atmosphere. The respiration uptake compound was carbon dioxide, and the combustion effluent was carbon dioxide. The ASTM D6866 result directly and specifically relates to the amount of carbon-neutral CO2 consumed and expelled. ASTM D6866 results assume all the carbon in the analyte/sample was either present-day or fossil. This assumption does not apply well to landfills older than 5-10 years since they will include excess bomb carbon from perhaps 20-40 years ago or to older trees that began growing more than 20 years ago. The “present day” end-component is ambiguous in such cases. The method best applies to high concentration CO2 effluents from combustion sources. Results obtained which are greater than 100% are reported as 100% for simplification. 1. Levin, Ingeborg; Miinnich, K 0; Weiss, Wolfgang. The Effect of Anthropogenic CO2 and 14C Sources on the Distribution of 14C in the Atmosphere. RADIOCARBON, VOL 22, No. 2, 1980, P 379-391.